You often can’t kill a tree just by cutting it down. Sprouting from the stump or the roots is a fundamental strategy by trees (and even more by shrubs) for survival and reproduction. In a natural setting, sprouting is an effective guard against the repeated loss of stems--e.g., through deer browsing of seedlings, or destruction by fire of mature trunks. In urban settings, stump sprouts are a significant maintenance problem. It can be onerous to remove young sprouts, and hazardous to let them grow. 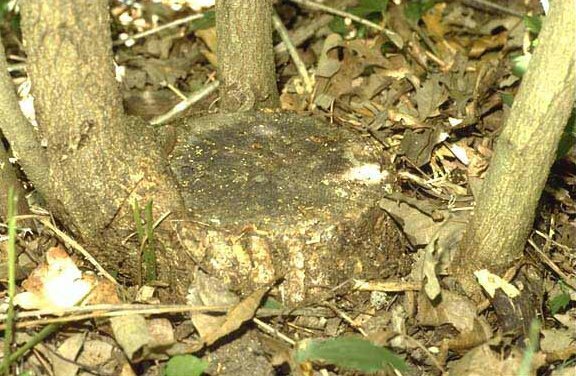 Young stump sprouts must be removed annually by mechanical or chemical means. If the stump is cut at ground level, sprouts can be controlled by mowing. If allowed to grow, such sprouts routinely produce multiple large trunks leaning away from each other that can pose a hazard later. Which common urban species cause the most trouble? Cottonwood and other poplars, boxelder and the "soft" maples, lindens, tree-of-heaven, willow, beech, red oak, crabapples and other trees in the rose family, and green ash. Some species (like black locust) pose particular problems because of their ability to sprout from roots, even well away from a tree whose stump has been ground out. What mechanical means are effective in urban settings? Stump removal. Grinding out the stump and large roots sharply reduces basal sprouting. Accelerated decay. Cut at soil level, drill holes, add slow-release fertilizer, and mound with soil. Growth regulators. Some forms of 2,4-D have proven effective when applied during the later part of the growing season by "frilling" (squirting into fresh trunk cuts), "cut-stumping" (painting or spraying on fresh stumps), or injection. Multiple applications may be required. Follow label directions. Phloem-transported compounds. Concentrated glyphosate-based herbicides are very effective during the later part of the growing season when applied by frilling, cut-stumping, or injection. Follow label directions. Phloem-transported compounds sometimes pass to other nearby trees--especially when same species--through root grafts ("backflash"), so be careful. Other compounds (such as triclopyr, for example) have also been show to work well when applied by frilling, cut-stumping, or injection. PLEASE NOTE: Follow manufacturer's directions. Consult the appropriate state office for registered pesticides that are labeled in your region for use on woody plants. All pesticides are subject to varying restrictions. Furthermore, changes in pesticide regulation occur constantly and human errors are still possible. Where can I get more information? Questions concerning the legality and/or registration status of a product for pesticide use in your state should be directed to the appropriate University Extension specialist or regional State Forester's office. For detailed product information, consult manufacturer’s labels, the current edition of the Farm Chemicals Handbook (Willoughby OH: Meister), or your state's registered pesticide website.